Took me few days to come up with this design. You see, there are many ways to wrap a donut pendant. The easiest is to coil the wire several times around the donut and you are done. Simple, easy and fast. I like my donut to be able to turn freely around the wrap when done. So, its worth the wait and I am quite happy with this design. 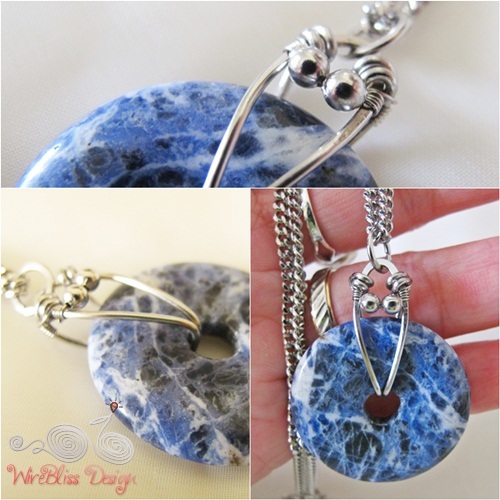 This blue stone is a commissioned piece. The rutile donut belongs to yours truly. This pendant went through several changes over the years. You can see it here (simple wrap that didn't last very long) and here (also didn't last long...I change my mind rather fast...hehe). The third and last design lasted several years (the longest) but I can't seems to find any picture of it here.....ish! ish! The wire wrapping is similar to this one here though (the yellow stone on top).